Discussion in 'MacRumors.com News Discussion' started by MacRumors, Mar 25, 2007. Is CS3 running native on the intel machines? Ugh at the price hike. I was planning to buy one of the Premium packages with Academic pricing because I assumed the current Creative Suite CS2 Premium was the same price. 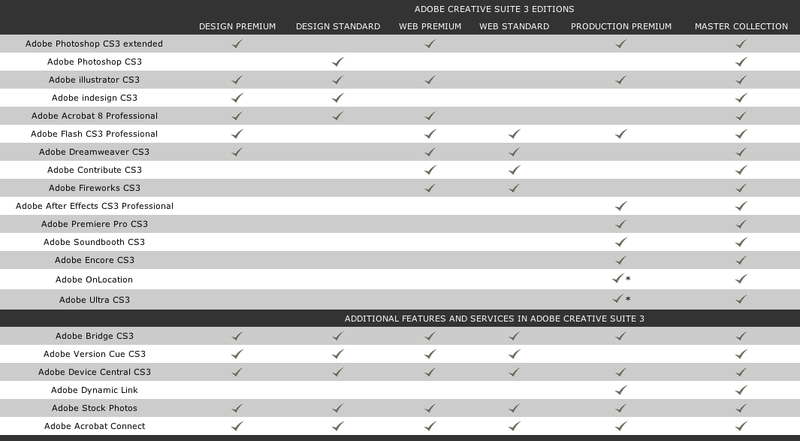 But it looks like Creative Suite CS2 Premium is the price of the new STANDARD packages. Oh well. Can't wait to see Academic pricing. I'm sure glad our school buys in volume at academic prices. Those numbers have a lot of digits in them! Wow. Thats um....really freaking expensive. Thank the lords for academia. good pricing guys...the only two items I would ACTUALLY want, and I would have to buy the lot. Now where's that Photoshop Killer that Apple have had up their sleeves for the last few years???? Can individual students purchase it at a lower price, or is it just for educational institutions purchasing it? Could they when CS2 was(is) out? I don't recall it. Er, I'm not a student, so I'm, out, then. Wow those prices are stupiedly to high for starving designers. I mean thats alot of money. Good thing I went back to school I hope I can qualify for academic discount. good to hear the ship date is April 20th... I was worried it would be later. I will be hitting up a friend for employee discount, so luckily these prices don't apply to me. yeah my mistake, just trying to figure out what the difference between the regular and the "extended" versions of photoshop are. But it looks to me that the web premium package is what I'm gonna be needing. Individuals can purchase at academic pricing. But only if they qualify as students...?!?!? There's a Mac version of Photoshop CS3 listed but that's not even in the pre-order stage; just says "we'll email you when it's available". Odd. Adobe appears to have graduated from the Microsoft Vista School Of Confusing Upgrades.